Shorty's guns are for sale! There is a listing for them at site that specializes in selling firearms. The seller is asking $75,000.00 for them and associated memorabilia. Skepticism abounds when items related to the Manson case are offered for sale. With an enormous amount of help from CieloDrive I believe that between the two of us we have authenticated the revolvers and along the way discovered a thing or two that we didn't know. Cielodrive.com has a section on Shorty with background information and the early days of the investigation into his murder. The guns are discussed in the links to the reports. The revolvers enter into the picture because they were evidence that members and associates of the Manson Family had something to do with the disappearance of Donald Jerome "Shorty" Shea. 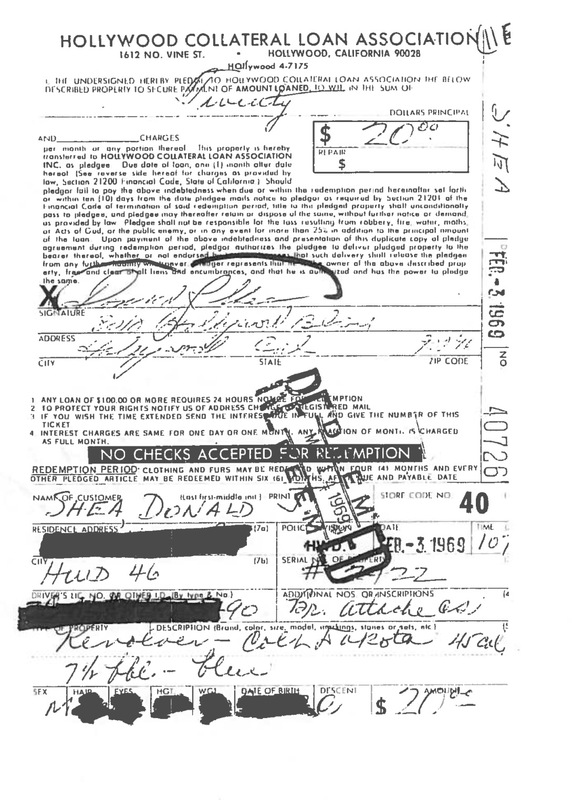 Danny De Carlo told investigators that he was given two pawn tickets that were taken from Shorty's body by Bruce Davis. These two pawn tickets turned out to be for the revolvers. De Carlo redeemed the tickets and took possession of the guns. De Carlo allegedly gave one of the one of the revolvers to Charles Manson. Two weeks later De Carlo learned that Shorty had been murdered where upon Charlie returned the revolver that De Carlo had given him and De Carlo using the alias of Richard A. Smith went to a different pawn shop and sold the revolvers. I was under the impression that Shorty's beloved guns were "pearl handled" revolvers as I have read this in various accounts. When I interviewed Windy Bucklee she was adamant that the revolvers had pearl handles. A March 9, 1987 LA Times article attributes Stephen Kay as saying the revolvers had pearl handles. In a statement to authorities November 7, 1970 Jerry Binder describes the guns as having pearl handles. Ed Sanders in The Family inexplicably describes the guns as having "brass handles", (2002, page 272). The "pearl handles" description does not seem to be true, the guns have walnut handles and there is no evidence that Shorty owned any other pair of revolvers. The serial numbers on the guns are the surest way of determining whether or not the revolvers are the ones that Shorty had had in his possession. The official reports state that the serial number on the guns were 2421 and 2422, they also state that the revolvers were Colt 45's but we will get to that later. One official report is the trial testimony of Magdalene Shea who was questioned about the guns. She, BTW, described them as having "brown" handles and said she knew the serial numbers because Shorty had pointed out the consecutive numbers of the guns to her and was able to describe just where on the guns the serial numbers were located. 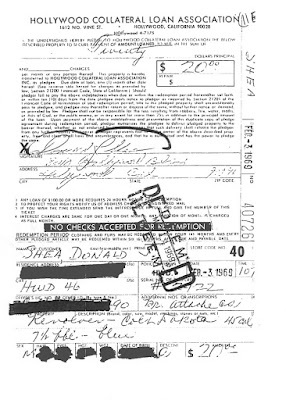 Another official report is the trial testimony of Arch Hall Sr. who sold the guns to Shorty. And thirdly, there are the pawn tickets from Shorty pawning the guns. Shorty had pawned the guns a few times when he was low on money. These tickets are from when they were pawned in February 1969 and the serial numbers are noted. A little about how Shorty came to have the revolvers. The revolvers were purchased new by a man named Arch Hall Sr.. Arch Hall was involved in the movie business, first as a stuntman with occasional small roles in films starting in the 1930s. He eventually started his own film company, Fairway International Films, in the late 50s which was solely to promote his son Archie Hall Jr. as an actor and singer. He had visions of his son becoming the next Elvis Presley. He completed about 11 films which were later pronounced as being the worst films ever made. Hall made Shorty's acquaintance when he shot portions of a movie titled What's Up Front early in 1963 at Spahn Ranch. Shorty and his second wife, Sandra, were living at Spahn with their three children at the time. Shorty kept in touch with Hall after the filming and hit him up for any possible film roles quite regularly. In 1964 Hall was filming a western movie, Deadwood 76, in South Dakota and due to some very bad weather the shoot in South Dakota had to be cancelled. Hall resumed filming at Corriganville, another movie ranch located next to Spahn's, but Corriganville did not have horses that approximated the look of the horses that were used in South Dakota so horses were rented from Spahn Ranch. Shorty was the person that took the horses over to Corriganville for the daily shoots and returned them to Spahn at night. Shorty also was given a small part to play in the film. The revolvers were acquired by Hall for use in the filming of Deadwood 76. Hall stated that Shorty fell in love with the guns during the shooting of the movie and pestered Hall to sell him the guns which he eventually did in 1968. They are-- Italian made copies of Frontier model Colt's with long barrels, and they are made in Milano. I had them made special for quick-draw. ...you file the triggers-- I'm not technically qualified to say, but it is so that you can fan the gun, shoot much faster with it. Q By Mr. Denny- Were the guns safe to fire real bullets? A I'd hesitate to shoot them. They are made in Italy to match a Colt and we never shot a real bullet in it. We shot reloads-- you know, blanks-- and I think they said they were alright, but because it was sort of a Mickey Mouse Colt, in a sense, we never used it for real bullets. So, the revolvers were not manufactured by Colt, they were less expensive Italian knock-offs that had been modified and Hall wouldn't have used live bullets in the guns. Most of the official report do refer to the guns as Colt's as does the current seller. The Seller provided both Cielodrive and myself with pictures of the serial numbers and a close up of the papers that are being sold with the guns. Arch Hall Sr. died in 1978, it was his son who applied to the Superior Court of Los Angeles County to have the revolvers returned. Cielodrive told me that these are the only guns associated with the Family that are known to have been returned to their owner. While Shorty did give Arch Hall something down for the purchase of the revolvers, about $25, two used cameras and some second party postal money orders, which bounced, as collateral. He did not finish paying off the guns nor make good on the money orders. As a matter of fact once Shorty had the guns in his possession he did not give Hall any more payments, only called with excuses from time to time. 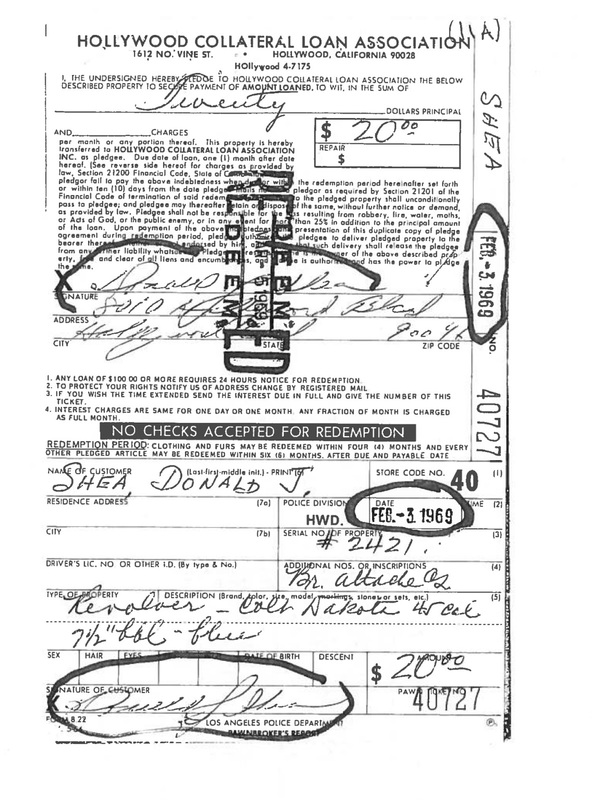 Hall had the receipts for the original purchase of the guns so that made the guns his. While reading the information at Cielodrive it occurred to be that Shorty wasn't as tall as I once thought. I have always thought that Shorty was 6'5" and the reason he was called Shorty was because he was so tall. Not so apparently, Kitty Lutesinger puts shorty at 5'10", Shorty's wife Magdalene says he is 5'10", information in one of the reports that looks like it's from Shorty's drivers license says he is 5'11". Shorty's autopsy report says the remains were 5'10''. Another myth shattered! Here is the movie Deadwood 76, see if you can find Shorty! Cielodrive and I could not. Shorty is suppose to be riding a horse in several scenes of the film and he was one of Sam Bass's "boys" involved in a gun fight towards the end and he gets shot, to the best of Arch Hall's recollection in the trial testimony. More of the in depth research we've come to expect from Deb and Cielo. I like movies that other people think are bad , so, after watching Arch Hall, Jr. I looked him up. It seems that after his acting career ended, he became an airline pilot flying the big ones the 747 and DC-10. Wow! Thanks to you both for the research put in here. I was laughing at the comment about Archie Hall Jnr's films as being "the worst films ever made." At least he tried! A few myths have been cleared up here. Like others, I thought Shorty was named as such due to him very tall. I now wonder if he got that moniker because he would have been short for a cowboy stunt man. 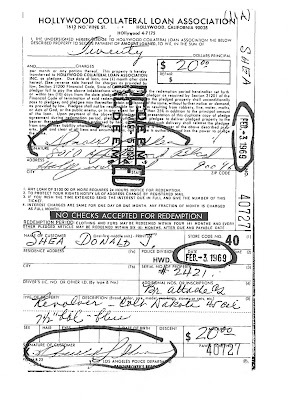 I'm disappointed that Shea kept the guns when he wasn't able to meet the payments, considering he was critical of the Family's conduct. Given that the guns are not genuine Colts, they really shouldn't be listed as such, and this may give the seller a problem post-sale. This post shows the extent to which Danny De Carlo was involved in the Family's activities, and yet, he managed to walk free. Really excellent stuff as would be expected from this combination of excellent researchers!! Superb work Deb S and Cielo, as always; thank you for sharing it here. Equinox spoke my mind about De Carlo. It seems to me there was a scattergun approach to prosecuting the Family. A lottery. It doesn't inspire confidence. Then again, maybe it has only the illusion of haphazardness. Maybe there were unspoken reasons for all of it. At the Grogan trial, the owner and seller of the two guns was identified as the Alaskan African gun shop in Glendale. The post is correct, the guns did not have pearl handles. I have also read that the guns were Great Westerns, also a manufacturer of copy of Colt lookalikes. Maybe Ward had the guns sold by the Glendale gun shop, who knows? $75 Grand? 4-5 thou would be a lot closer to their value, Manson provenance or not. At the time, these "knock-off" guns made in foreign countries were just plain DANGEROUS - but they were CHEAP. AND to even attempt to "fan" one was just plain "stupid." GOD - it must have been just plain FUN to be a "stuntman" on a cowboy movie. There was a famous actor and well known movie where someone put "real" bullets in a gun - on the set. YOP - someone died ! Pearl Grips / wood grips - they are inter-changed all the time. BUT so are many forms of evidence. NOW - a little OFF base, but right in the game. I've been watching the new PBS program on the human brain and last night they talked about "parole hearings." Apparently a study was done of over a thousand cases put before "parole boards" The object was to undersand how the same board members, dealing with the same type cases, could rule differently. 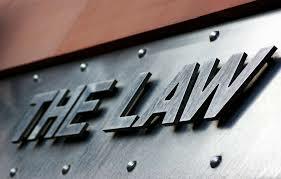 The result was, as they found, parole boards would issue a denial for a case, heard before lunch, where a very similar case was 2 times more likely to receive the granting of "parole" when heard within a short time after lunch. "The result was, as they found, parole boards would issue a denial for a case, heard before lunch, where a very similar case was 2 times more likely to receive the granting of "parole" when heard within a short time after lunch." you have just uncovered the truth behind parole board decisions - it's all to do with food!! Could it be that the boards are also provided with some alcoholic liquid refreshment at lunch which makes them more relaxed?? equinox, when I'm liquored-up I tend to start looking for people to hang, so it all depends. "equinox, when I'm liquored-up I tend to start looking for people to hang, so it all depends." I would imagine having a parole hearing on a Friday afternoon could sway things in one direction as well. Wasn't there a kerfuffle a while back about the size of Shorty's skeleton? The discussion about Shorty's height is making Patty remember that. It would depend on which manufacturer made the revolvers, the Italian Colt copies varied greatly in quality. I would have been just as hesitant to trust the trigger modifications as I would the quality of the firearm itself, very dangerous practice. The two largest manufacturers there now, Uberti and Pietta, make very serviceable copies of vintage firearms, both cartridge and percussion. Colt still manufactures both the SAA and New Frontier revolvers, but they are very expensive; the quality Italian copies are about one half to one fourth the price of the real thing. Part of the confusion in the "Colt" name is the caliber of many of these guns, one of the most common chamberings for single action revolvers is the .45LC, "LC" being an abbreviation for "Long Colt". So Colt not only built the original version of the Single Action Army revolver, but designed the cartridge as well. ".45 Colt" could apply to the cartridge the gun fired as well as the manufacturer. The iconic revolver was introduced by Colt in 1873, original specimens in good condition now are highly collectible and can cost thousands of dollars. Genuine Colts were highly desirable even in the 1960's, and cost a substantial premium over other brands. Forgot...thanks for the work that goes into this blog, it's refreshing to see an outpost of intelligently written stuff in the tangle of the interwebz. Excellent job. Thanks everyone for your comments. Coincidentally my husband and I had signed up to take a handgun class together, which was today. I am so exhausted! I do have a couple of replies to your comments but they will have to wait until tomorrow. Orwhut, you can get your fill of Arch Hall's movies, there is a list of them at the IMDb website. Looks like Hall did a Zombie movie before Zombies were cool! Shortys Pistols, I got my info about who owned the guns when they were "sold" to Shorty from Cielodrive who provided me with Arch Hall's testimony from the Grogan trial. I know the Alaskan African gun shop in Glendale fits in the story somewhere and perhaps they were the ones who sold the revolvers to Arch Hall when they were new and/or maybe they were the ones to modify the guns. Hall did not say in the transcripts who he bought them from. I agree that asking $75,000 is way too much and my thought was the same as you did concerning the current value. They are not great guns to begin with, they have been modified and the only thing they have going for them is their connection to Shorty and the Family. StarRider, you get two points for using the word cartridge correctly, three times! I was troubled by the revolvers being referred as Colt's, not only in the trial testimony but also by the pawn shop. I figured it must have been the type of cartridges used. The only "Dakota" gun I could find made by Colt's was a commemorative model called a Dakota Territory Scout but it wasn't made until 1966 and there were only 1000 made. I asked the seller to send me the name of the manufacturer but he didn't, I only got the two photos I've posted. Thanks DebS. Your research and effort is much appreciated. I enjoyed this post. Thanks. I've gotten a few from NetFlix on DVD. Most of the kind I like aren't streamed. Am I the ONLY one who sees somethnig outt'a place with these GUNS ? Here's this "rough & tough" COWBOY type with HIS prized pair of "six-shooters" BUT there's NO holster ! They are apparently for SHOW only! If HE had a "working" GUN, holstered at HIS side, when the MANSON Gang came a call'in, maybe HE would still be alive. Had the gun been holstered on HIS side and LOADED, and HE wasn't afraid to shoot it, He WOULD be ALIVE. AND at the time of his death, carring a loaded gun was LEGAL. So just what the FRECK is going on here ? Thanks DEB - you got ME to think'in and "think'in is MY kind's HIGH. PLUS it does ME good. The trial testimony of Arch Hall did talk about the holsters, Robert, but apparently the holsters are not being offered for sale. Not sure why. They were branded with Hall's film company's initials, FIF, and Arch Hall's name. So Shorty did have holsters. The testimony from Shorty's wife, Magdalene, said that he kept the revolvers and holsters in an attaché case where he had written "Reverend Donald Jerome Shea" on the front. "...where he had written "Reverend Donald Jerome Shea" on the front." Deb, any idea what the 'Reverend' reference is all about? I didn't know Shorty was 'a man of the cloth'. Thanks DEB, but you see where just one piece of missing info can change the entire dimension of ANY subject. AND without the holsters the defective / altered guns are basicly WORTHLESS. 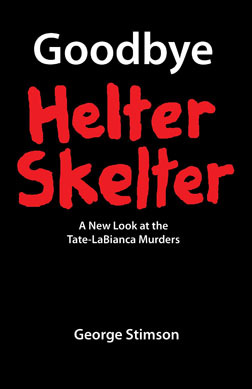 EXCEPT the "worn-out" copy of Helter Skelter may be worth a couple of bucks on eBay. "OR WHAT" That's kind'a funny. EXCEPT all the smart money is NOW being invested in knives. More dramatic, more scary, can suffer longer, better horror movies, etc. etc. GUNS, Republicans and Water SPRINKLERS are going to be "Banned" in California soon. 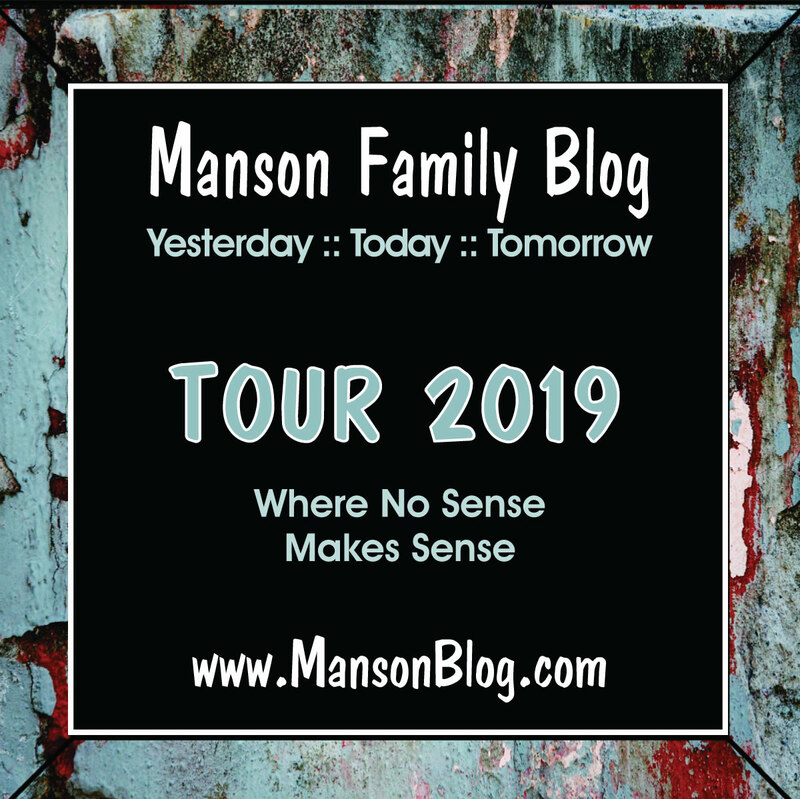 The Palistinians see the writing on the wall and are "testing" KNIVES, as we blog. They just can't seem to get the silencers to work. "If HE had a "working" GUN, holstered at HIS side, when the MANSON Gang came a call'in, maybe HE would still be alive." The one about the Palistinians testing knives makes me think about a line from Butch Cassidy and the Sundance Kid. I don't think I need to quote that one, everybody knows it. In a newspaper article in '71, the owner of Alaskan African gun shop could not testify at the Grogan trial because there was a fire at the shop on a Sunday. Maybe Arch Ward Sr was a pinch hitter to establish that Shorty had purchased the guns? who knows? Some of the comments that the .45's were Mickey Mouse and dangerous to fire strike me as a tad xenophobic. Italian knock-off .45's can be just as quality a weapon as the Colt .45. You just don't pay the extra bucks for the four letters in the Colt name. Arch HALL testified at the trial that he was the owner of the revolvers, he had a bill of sale for them that established he was the owner. The revolvers were returned to Archie Hall Jr. after his father's death. They wouldn't have been given to him if he was not the rightful owner. The guns had been modified to be able to do fast draws and other trick stuff a stuntman would do. They were not stock revolvers. The fact that the seller wouldn't give me the name of the manufacturer just might mean that they were crappy guns, too. I suspect the author of the article you referenced made an assumption about it being the shop that Shorty purchased the guns. Bob Bickston was scheduled to testify at the Grogan trial on Monday, July 26, 1971. He didn't, because the gun shop where he worked, Alaskan African gun shop, caught fire late on Sunday night. The shop was owned by his brother. Bickston did testify the following day, but didn't testify that Shorty got the guns at his brothers shop. Arch Hall testified a few days later about selling the guns to Shorty. This was confirmed by other witnesses that knew Shorty. I think the author of your article was just confused. Thanks to both of you for clearing that all up, great research all 'round. Arch Ward was a famous sportswriter and sports promoter in these parts. When I typed Arch my fingers keyed in Ward. If you find the make of the gun, post it if you can.